Today the Church celebrates the Fourth Sunday of Advent. We light the last candle on our Advent wreath and our preparation for Christmas is almost finished. We also reach the culmination of the O Antiphons. In previous antiphons our cry was directed to the Messiah as He manifested Himself to the Chosen People, to the Gentiles, and in nature; now He is addressed in person and asked to remain with us as Emmanuel. Reading this final antiphon gives the feeling that a climax has indeed come. The very term Emmanuel, God with us, reveals the kindly, human heart of Jesus — He wants to be one of us, a Child of man, with all our human weakness and suffering; He wants to experience how hard it is to be man. He wants to remain with us to the end of time, He wants to dwell within us, He wants to make us share His nature. The feast of St. John of Kanty, which is ordinarily celebrated today, is superseded by the Sunday liturgy. The first reading is taken from the Prophecy of Micah 5:1-4. In today's reading we hear words of hope that focus on one who is to be born in Bethlehem and who will bring in the day of peace when all nations will look to Jerusalem. The second reading is taken from Hebrews 10:5-10. The perfect offering of Christ restores us to oneness with God. Jesus came to do the will of God perfectly. He overcame the power of evil that separates us from God and became our bridge back to God when we fall into evil. David prefigures Christ's sacrifice. The Psalm is now seen from the perspective of Christ. 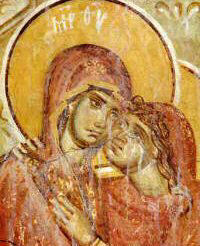 The Gospel of this Sunday, Luke 1:38-45 recounts the visit of Mary to St. Elizabeth. An ancient title of Mary is Ark of the Covenant. The Church Fathers saw the parallels between the Old Testament wooden chest containing the divine presence and the Virgin about to give birth to Jesus. This theme is developed in a tape series by Tim Staples. Tim brings out the similarities between today's Gospel and the ascent of the Ark to Jerusalem (2 Sam 6:1-15). In today's Gospel, Elizabeth says to Mary, "Who am I that the Mother of my Lord should come to me?" She tells how the babe (John the Baptist) leaped in her womb as she became filled with the Holy Spirit. Finally Mary remains three months with her kinswoman before returning to her home. This Sunday, so close to Christmas, the Church invites us to focus our attention on Mary, round-wombed because of the God-child. As we say in the Litany of the Blessed Virgin: "Ark of the Covenant, pray for us." "O Emmanuel (God with us), our King and Lawgiver, Thou expected one of the nations and their Redeemer, come and save us, O Lord our God." Now we are about to receive the Savior, Emmanuel, God with us. God's only-begotten Son, born of the Father before all time, God of God, light of light, true God of true God, one being with the Father, is about to be born in time. For the salvation of men, He has come down upon earth and is conceived by the Holy Ghost in a virgin. He shall be called God with us, and yet He will be one in nature with us. He is to be like to us in all things except sin. He wills to share our poverty and to pray and suffer with us; He assumes our guilt. He is God with us in every phase of our life; He even takes our place on the cross, He remains with us in Holy Communion, in our daily Mass, and in our tabernacles. At some time in the future He will still be God with us in His beautiful heaven. All this He has done for us even though we have repeatedly turned our back on Him. Come and save us." The great God is with us. He has come, not to destroy the sinful world, as He once destroyed Sodom and Gomorrha, but to redeem it from its sins. This redemption is to be accomplished at the cost of great personal sacrifice to Him. As if this did not satisfy the burning ardor of His love, He wills to remain with us in our tabernacles. He incorporates us into Himself and shares His very life with us. We are engrafted in Him as a branch might be grafted to a new tree. "I am the vine, you are the branches" (John 15:5). God with us! We are united to Christ as a limb is united to a body, as a branch is united to a vine. We now belong to Christ and no longer to ourselves. We are one with Him. What a grace, what greatness, what nobility have been conferred upon us! God looking upon us no longer sees miserable specimens of mankind, but members of Christ. When He looks upon Christ, He sees Christ and us as united in one body, as a tree united to its branches. Even the smallest leaf fluttering on the farthest branch belongs to that tree and lives by the sap of that tree. Could He have redeemed us in a more perfect manner than by thus implanting in us and infusing in us His divine life? Let us reflect upon this seriously. God with us! It was that He might be with us that He came that first Christmas at Bethlehem. He came that He might lift me up from the dust, and that I might share in His life. He will return this Christmas that He may continue and complete that work. It is for the same purpose that He comes in every Holy Mass and Communion, and in each inspiration and grace He gives us. His final coming will be for the same purpose, and will have the further aim of sharing with us His glorified life in heaven. We shall then enjoy the perfect vision of God, perfect love, and the fulfillment of all our desires for all eternity. For all eternity! The manger reminds us of the simplicity and poverty surrounding the birth of Jesus and is representative of His life of humility. Today is Day Eight of the Christmas Novena. "John, the son of Zachary," to a world now awaiting its God, pleads for our final pre-Christmas "make ready." "Make ready the way of the Lord, make straight His paths" (Gospel). Heroically, in the desert, he warns against the softness of life in the city, pictured in the background. Alive to the danger of a "soft garments" life, he is seen in a rough "garment of camel hair," carrying a baptismal shell, "preaching a baptism of repentance."